This post is my expression of style for ‘A Style Of My Own’ blogger contest by Women’s Web and Trishla emart. I work at Women’s Web, so I guess I can’t win but I could not resist writing this one down. A couple of years back; I was on one of my first International trips. The lady sitting next to me was wearing a white suit which was well cut and a white hat. I was pretty impressed with the way she looked and carried herself, I wished I could look like her. Consecutively, I tried to amp up my style while traveling but all my efforts to emulate her were pretty much in vain. I tried wearing boots but was fed up of having to remove them at every security check. I then experimented with some necklaces with had a similar outcome. After a lot of trial and error,I think I am finally onto something which I can safely call my travel style.It happens to be printed cotton pants and a longish cotton top! This attire is comfortable, doesn’t ride up or down without my permission and dries up pretty fast in case of a toddler related accident. I have a couple of variants of this combination in dark colors because dark colors don’t show baby spit up as much. I sometimes team it up with a jacket, if we were going some place cold. It ensures that I don’t land and freeze to death in case the airline forgot my baggage. When traveling with a kid; surviving the trip takes precedence to looking stylish. When my baby was younger, I preferred wearing him inside a cotton wrap so that I had my hands free to tug luggage. I had this amazing K-Tan wrap that would let me wear the baby close and comfortably. It was also very easy to wear/wrap which is must while traveling with a baby. Here is how I looked at airports when I traveled alone with my baby; I would be in my cotton pants and shirt, I would have a baby tied in front of me, a back pack on my back with my laptop that could not go in check in baggage and a largish diaper bag with necessities for the baby. The diaper bag though helpful during long trips, was a cause of concern for my friends and relatives as we always looked like we were going to shift into their homes instead of just visiting. But it held things that I could not be parted with at the time, like my nursing cover, diapers, extra food, extra clothes, multiples of wipes because babies don’t magically stay clean. Now my diaper bag has been retired because my baby is a toddler now and the sling wrap been tucked away into a corner in the cupboard. Traveling with a kid requires a lot of planning but the more one travels it starts becoming easier. Now that my kid is at an age when he can run around at the airport like on of those Duracell bunnies, I kind of miss our K-Tan wrap days. Very few airports/train/bus stations are truly baby friendly and China makes the list of baby friendly airports. 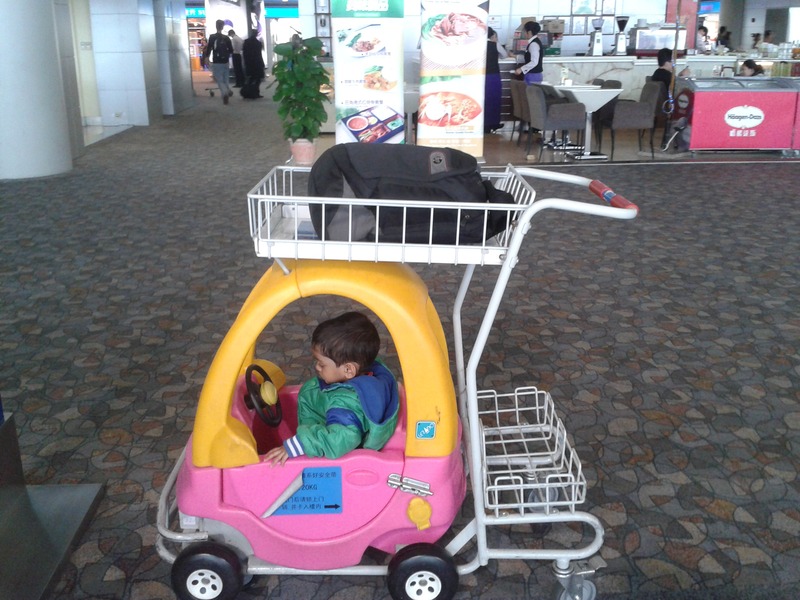 Airports in China had play areas for toddlers, luggage carts that looked like cars that they can ride on and special seats for babies/kids inside the toilet so that moms can take a leak without having to hold the kid. To be fair most big airports these days have started having baby changing stations and feeding rooms which is great. But I wish more airports would follow China’s example and be a little more thoughtful. Till then I will have to continue choosing function over fashion when dressing for travel. I tend to dress simply and not flashy when I travel. Or I try to wear heavier piece of clothing, so my suitcase is a tiny bit lighter or allows more room for other packed stuff. For instance, I will wear a pair of jeans and lined dress jacket (if I have to go to dressy event). Like you, I learned the hard way NOT to wear any belts with metal because of the airport security. I am sure you look pretty cool the way you dress.